Click above to check it out or call 714.525.7590 Fullerton Municipal Airport. Gift Certificates Available. Groups are Welcome! Captain Dave's specially designed Sailing Catamaran can get you UP CLOSE to wild dolphins and magnificent whales all year round. BE one of the pod and feel what's it's like to swim with dolphins without getting wet in our Eye-to-Eye Underwater Viewing Pods! Hear the animals with our underwater hydrophone, while an experienced marine naturalist shares our collection of marine mammal artifacts and explains how the animals live. Mrs. Captain Dave's yummy Triple Fudge Brownies are served complimentary on every safari. Our high-speed, high-tech, catamaran is never crowded. Your dolphin & whale watching trip is broadcast live on our website! An award winning filmmaker, author, and whale disentangler, Capt. Dave is a leader in ocean wildlife education and conservation. 2 and 1/2 hours daily. Reservations recommended. 90-minute evening cruise aboard a luxury catamaran. In the spring and summer enjoy a evening of sunshine, cool ocean breezes and romantic views. In winter, take in stunning views of the beautifully lighted Dana Point Harbor. This cruise will feature a sampling of wines from The Organic Cellar which promotes organically grown and pesticide-free wines as well as a sample platter of cheese, crackers, fruits and nuts that compliment the wines. 5:30 pm - 7:00 pm. This cruise runs Fridays and Sunday nights. Davey's Locker in the Historic Balboa Pavilion (famous Orange County landmark) next to the Balboa Funzone has over 40 years of history providing whale watching cruises. Endorsed by the Orange County Cetacean Society, Davey's Locker provides year round whale watching cruises daily. During the winter and spring months witness the grey whale migration and during the summer and fall months the giant blue whales. With the nutrient rich waters just outside Newport Bay providing ideal habitat for several species of whales and dolphin, Davey's Locker has one of the highest number of sightings in California. Davey's Locker takes great pride in their 96% success rate viewing whales and/or dolphin. Sightings are so good, that they guarantee sightings on each whale watching cruise. A specifically built for whale watching ship provides viewing opportunities from any point on the ship. Play Xbox One, PC games or immerse yourself in Virtual Reality at Howie’s Game Shack®. 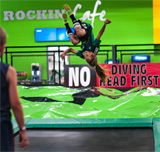 Open 7 days a week – 13 hours on the weekdays, even longer on weekends. 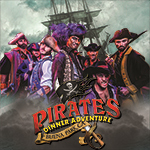 In addition to rows upon rows of dedicated gaming PCs, gamers can enjoy hot food made to order, a variety of snacks, and cold beverages to be consumed while playing to avoid breaks in the action. Casa Romantica Cultural Center and Gardens maintains the historic Spanish Colonial Revival estate of Ole Hanson, the founder of San Clemente. The magnificent home and 2.5 acres of gardens overlooking the San Clemente Pier are open to the public Tuesday-Sunday for tours, and the home’s award-winning cultural center hosts a rich selection of performances, exhibitions, lectures, and workshops year-round. The Richard Nixon Library & Birthplace opened its doors on July 19, 1990 with celebration, fanfare and more than 50,000 friends and well wishers including Presidents Nixon, Bush, Reagan and Ford and their First Ladies. It is a privately supported, non-profit institution dedicated to educating the public about the life and times of the 37th President and encouraging interest in history, government and public affairs. This federal courthouse was nominated for the Presidential Design Awards 2000 and for the Presidential Millennium Award for Design Excellence. This building, which incorporates technology and tradition, since opening, has become a catalyst in the revitalization of downtown Santa Ana. Docked at the Ocean Institute, the Pilgrim is a full size replica of the hide brig immortalized by Richard Henry Dana, Jr. in his American seafaring classic novel 'Two Years Before the Mast'. Dana said of the Pilgrim, "The vessel I am going on is small, but strong and a remarkably fast sailer having been built for the smuggling trade." Dana Wharf has been bringing the highest quality fishing and whale watching experiences to residents and anglers of the Dana Point and surrounding areas since 1958. Dana Wharf is proud to offer the best whale watching deals on the west coast - trips as low as $16! Dana Wharf showcases several top of the line vessels and all of the boats ensure total passenger comfort and enhance the fishing and whale watching experience. Dana Wharf's experienced, family-oriented crew is there to make your fishing and whale watching experiences as enjoyable and educational as possible - every skill and experience level is welcome! Dana Wharf guarantees our whale watching cruises! If you don't see a GOOD showing of whales or dolphin, you'll get your ticket back to come out with us again any time in the future for FREE! Use coupon code OCNET for a 30% off your fishing or whale watching excursion. 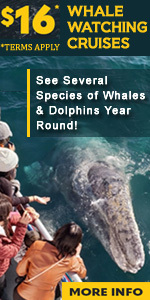 Mention Orangecounty.net And Get $15 Whale Watching Cruise Rate! Newport Landing offers multiple whale watching cruises daily year round. View giant blue whales to over 100 feet in length during the summer and fall months and grey whales on their annual migration during the winter and spring months. Huge pods of several varieties of dolphin, finback whales, minke whales, humpback whales, killer whales, and sea lions are viewed as well. A 96% success rate in viewing whales and/or dolphin means almost every trip has viewing opportunities. Our whale watching ship was built just for whale watching with seating and viewing options from almost any part of the ship. 65 feet in length the stability and comforts are great for those concerned with being on the ocean. Sightings are Guaranteed: You will get a free trip if we do not see whales or dolphin! The Orange County Zoo is located inside beautiful Irvine Park. The park is located within the city limits of the City of Orange. The zoo is nestled among the majestic 477 acre wilderness park. The zoo specializes in the animals and plants from the southwestern United States. 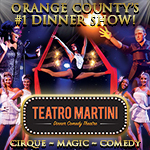 OrangeCounty.net - Premier listings for Orange County Attractions featuring historic sites, landmarks, zoos and petting zoos.